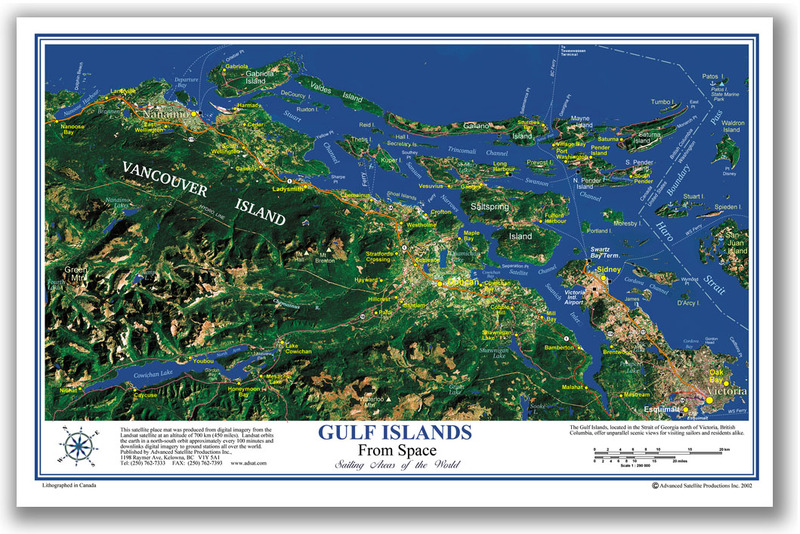 The Gulf Islands are jealously considered by the local residents as the most beautiful place to live in the world. One look at this handsome place mat and you will know why. It's a boater's and sailor's paradise, with countless channels and bays. Located in the Gulf of Georgia between Vancouver and Vancouver Island, the Gulf Islands have become home to people who eschew the fast-paced city life and long for something closer to "Green Acres". Feature: 17 in. by 11 in. Feature: Scale 1 : 120 000 Approx. Copyright Advanced Satellite Productions Inc.. All Rights Reserved. eCommerce Software by 3dcart.